(Almost) Wordless Wednesday – He’s Here! I’m feeling great! This c-section was way easier than the last one. 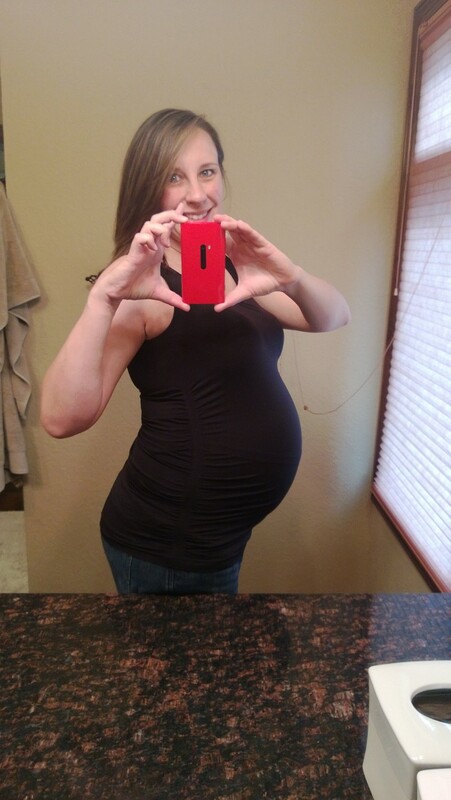 I’ll write more later, but there was something found with my uterus that would have caused “a catastrophic rupture” had I tried a VBAC or even labored too long before an emergency c-section. I have never been so thankful that we chose the safest route for our son and for me. Whew! I look at Bryson and thank god/fate/whatever that he waited for our scheduled date to make his appearance! And here he is…. For now! One last goodnight before you’re a big brother. I sneaked this one in at 11:30 just before heading to bed. I’m secretly hoping you’ll wake up and call for me tonight so I can snuggle you just a bit more. Categories: Matthew, THIS Moment in Time | Permalink. It’s been a very emotional day – I’m finding that I’m always weepy on Matthew’s birthday. But today is a bit different because it’s his last day as our only child. Tomorrow, the day after his 2nd birthday, he will become a big brother. I know he’ll love it, but it still makes me a little sad. I have cried off and on all day, and sobbed my eyes out after putting him to bed tonight. I know it will be OK – I know it will be GREAT. I just wish that I could have one more day of just us. Categories: Bryson, Matthew | Permalink. The Monday Snapshot – 2! 11:15 – Science Center for the first time – it was a hit! 5:30 – B took Matthew on a ride in the Burley for the first time – he loved it! 5:50 – Matthew tried out his new BIKE! 6:15 – Hung Matthew’s room-darkening mural! 7:10 – Took a family walk to the neighbors’ to take them leftover cupcakes from Matthews birthday party. He got to play with his best friends, V and W! Happy birthday, sweet, sweet boy! I love you so much! Categories: Birthday, Caking, FUN!, Matthew, Monday Snapshot, PAIL | Permalink. 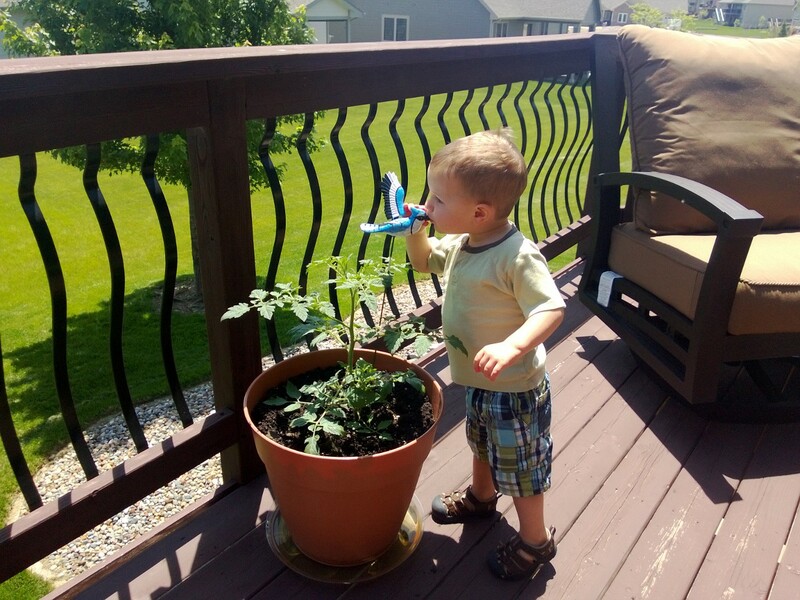 Matthew kisses everything he loves, including his bird friend who keeps his tomato plant company! The Monday Snapshot – Healed? This weekend, I needed to look for something under my bathroom sink. Many things get tossed under my bathroom sink (extra hair products, toothbrush head replacements, contact solution), but something very personal is kept there too. My used and unused fertility drugs, needles, prescription labels, and old HPT’s (only ones from my successful cycles) are kept under my sink – far away from anyone who would wonder why I still have them, but close enough for me to always know they’re there. I had to dig and dig to find what I was looking for (and never found them) and pulled the bags full of unused needles, labels, extra meds, and HPT’s out to keep searching. I then found a 2 liter bottle full of fertility needles and used vials – probably from the cycle that worked for Matthew. 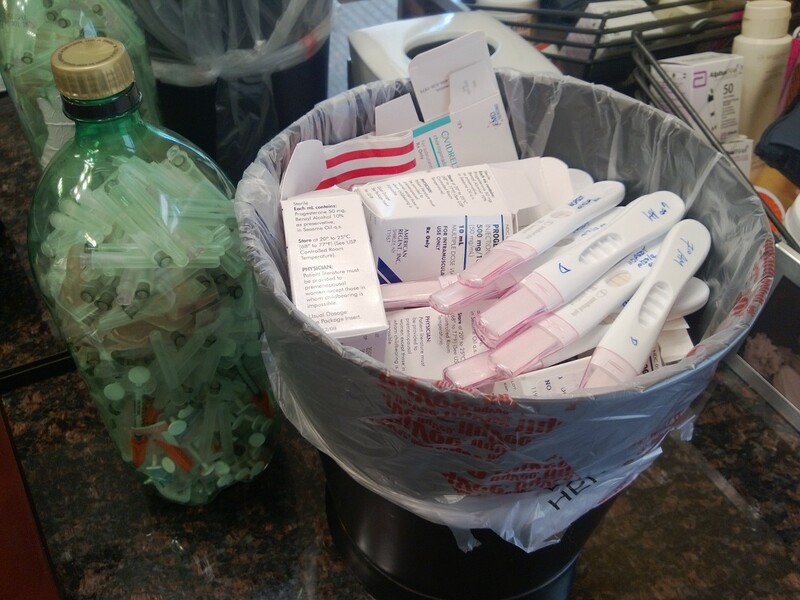 I disposed of many, many IVF needles about 4 months ago and did not know that I still had a bottle full of used needles from our IVF efforts stashed away somewhere. I was sort of stunned to find them, actually. Under my sink were 4 IVF (2 fresh and 2 frozen) cycles worth of used needles, memorabilia, and emotions. And now in my garbage can, shred pile, and (proper) needle disposal containers are 4 IVF cycles worth of… nothing. Several months ago, I was not ready to let go of all of this, especially the prescription labels. Today – I am. As I cut the 2 liter bottle open (because you can’t dispose of them that way, apparently, so I needed to put them in laundry bottles instead) and sifted through various needles and vials of used medications, I remembered certain things. I thought about how I administered Foll.istim (I had forgotten how the needles screwed onto the pen), how I mixed my Repron.ex each night, and how surprised I was that Ovid.rel came in glass syringes. But I was not emotional. I was not at all clinging onto these things any longer. The same is true for the prescription labels I dutifully pulled off of boxes and bottles to put in the shred pile as I put the bottles and boxes in the trash. I thought a little about the HPT’s from this cycle and decided to just keep the first one that showed me that Bryson was coming (4dp5dt) and the one taken at 7dp5dt because that was the date of the one I still have from Matthew’s cycle (they were transferred on the exact same date, just 2 years apart). All the rest went in the trash can. Am I healed from the pain of our infertility? Those prescription labels were a testament to what we went through, the years of agony and depression, the effort we put into building our family. Today – they are nothing more than trash. I dare say I might be healed… and that’s a good feeling! This is my contribution to the Monday Snapshot at PAIL. Categories: Infertility, Monday Snapshot, PAIL | Permalink.